The exterior is constructed from sheet steel finished in an easy clean epoxy powder coated paint. The interior is made from mild steel coated with aluminium (CLAD), with a stainless steel collection tank, drain and flow tap. A range of highly efficient and reliable ovens, suitable for de-waxing formed components and collecting extracted wax. The chamber is vented; fitted with fixed shelf runners; removable chrome plated wire grid shelves, and a stainless steel drip tray. Heating: The heating elements are high quality inconel sheathed elements carefully positioned around the air circulation fans to ensure good temperature uniformity within the work chamber. 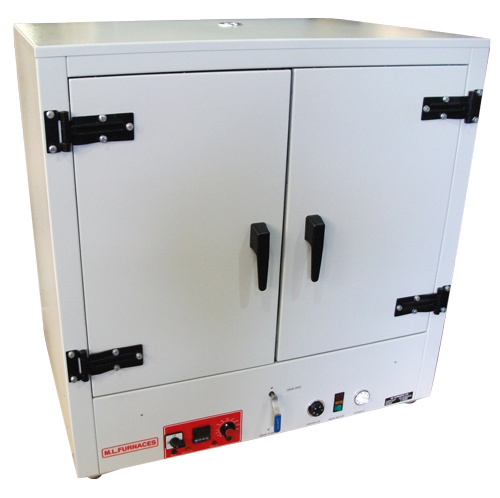 Power to the heating elements is controlled by solid state relays for accuracy and reliability. The wax drain is independently heated to ensure that there are no blockages as the wax leaves the oven collection tank. Controls: A microprocessor based digital temperature controller with set-point and process displays provides accurate fully automatic oven temperature control. The controller includes thermocouple break protection. The wax drain heater is controlled by an adjustable thermostat and for safety an adjustable independent over-temperature thermostat is fitted to both the oven and drain temperature control circuits. Options include: alternative sizes / stainless steel chamber / choice of temperature and over-temperature controls / programmers / recorders / timers / floor stands etc.